"It calculates the enormous economic, psychological and social toll of gender-based violence on survivors, their households and communities as well as for the country as a whole. The study, “Estimating the cost of domestic violence against women in Viet Nam” concludes that both out-of-pocket expenditures and lost earnings represented nearly 1.41 per cent of the Gross Domestic Product (GDP) in Viet Nam in 2010. Moreover, it estimates that women experiencing violence earn 35 per cent less than those not abused, representing another significant drain on the national economy. As a result, an estimate of overall lost productivity comes to 1.78 per cent of GDP. The direct costs of incidents of intimate partner violence include the cost of seeking medical care (physical and mental), shelter, mediation, counseling and legal services, judicial resolution, as well as the replacement of property. There are also indirect costs such as income loss due to missed work, loss of reproductive labour, impacts on children’s health and school performance as well as missed school days. As an Asian culture of afraid of loosing faces, the family of the women can hardly accept that a woman can get divorce nor escape from her husband now matter how badly they could have been abused. The social pressure is always too much for the women to handle, community leaves it as it is from family issue and should be resolved within family. In addition, the women often feels embarassing, financial dependent and many other aspects that make them accept domestic violence. One of the worst consequences of this is the kids who witness domestic violence and continue that cycle as they grow up. We are about to do something very exciting, a Social Enterprise that provides healthy lunch box to office workers while creates job for those women who has escape from their husband from countryside to the city, and give them the tool to earn money, establish their new lives and in a long term, enable them to be financially independent and build inner peace & self-confidence. By empowering these women, they will also be able to bring their children back to school and grow them in a non-violent environment, advocate other women to take courage to change for a better future, help raise awareness of domestic violent in which Vietnam still has a long way to solve this issue. Every dollar counts and will truly make a difference in the lives of so many women. We hope to have your support by any means, whether from your expertise, donation in kind or dollars are always welcomed. 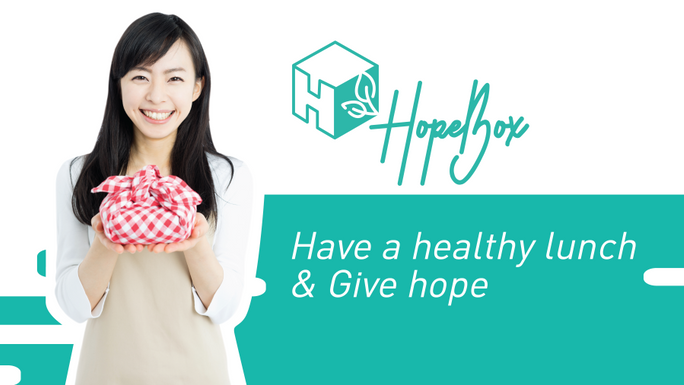 Join us to bring HopeBOX to live, enjoying a delicious lunch while creating positive impact to the live of many disadvantaged women in Vietnam who have been sufferings with domestic violence. This fundraiser is part of the "HopeBox - Healthy Food for Good Cause " campaign. Together with other fundraisers, they've raised $1,530 so far!